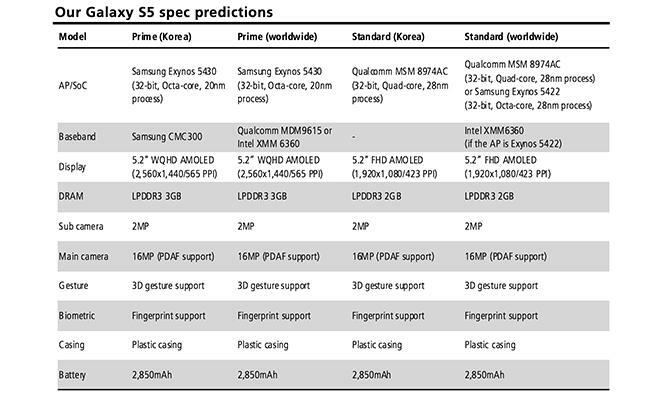 As Samsung readies its Galaxy S5 to take on Apple's iPhone later this spring, one analyst believes the Korean company will be playing catch-up with an embedded fingerprint sensor and 32-bit processor. According to a research note obtained by AppleInsider, KGI analyst Ming-Chi Kuo predicts Samsung needs a fingerprint verification system to keep up with the market's rush toward on-board biometrics spurred by the iPhone 5s. While Apple was certainly not the first to implement biometric security in a portable device, it sparked a trend by introducing a simple, effective and, most importantly, reliable solution with Touch ID. By leveraging the popularity of the iPhone brand, Touch ID is now in the hands of millions of consumers, leaving other manufacturers scrambling to get out similar products. As for Samsung, Kuo believes the company will use fingerprint recognition technology built by partner Validity Sensors, a firm purchased by touchpad maker Synaptics last year. "Fingerprint is necessary for a star model," Kuo writes. "Because Apple's iPhone 5S and HTC's One Max have fingerprint, S5 the star model can't lack the function even [if] the solution (area type same as iPhone 5S's provided by Validity) is not as mature as iPhone 5S's." Kuo believes Samsung will once again make a grab for high-end handset marketshare by pushing out two models differentiated by processor type, display resolution and memory. Both versions will continue Samsung's big-screen blitz with a 5.2-inch display, with the top-end "Prime" iteration employing a WQHD AMOLED panel with a pixel density of 565 pixels per inch. Powering the handset will be an in-house Exynos 5430 processor built on Samsung's 20nm process and 3GB of LPDDR3 RAM to help with graphics duties. The chip is not 64-bit silicon like that found in Apple's iPhone 5s, iPad Air and iPad mini with Retina display. Other features include a 16-megapixel rear shooter with support for phase detection autofocus and 3D gestures. The S5 will likely carry over a plastic shell design from this year's S4, though metal-clad products are on the horizon, says Kuo. Apple, on the other hand, has chosen to build its handsets out of premium materials like metal and glass since the iPhone 4, which debuted in 2010. Countering rumors, Kuo feels Samsung is not prepared to introduce iris scanning tech in the upcoming flagship Galaxy. Earlier in January, Samsung's vice president of mobile Lee Young Hee said the company was "studying the possibility" of incorporating the feature into future products, but would not comment on whether it would be ready for the S5's launch.